More often than not, Monday Night Raw is perfectly fine. There are extremely dull episodes last week’s go-home show, and there are episodes that string some memorable segments together and deliver something classic. But more often than not Raw falls right in the middle. It’s the nature of the format at this point. When a show is three hours long it’s bound to contain ebbs and flows, some good and some bad. If the balance is off in any way you get those wild swings in quality that define certain periods of WWE. If the balance is kept though you get episodes like tonight’s, where some great segments and good in-ring storytelling are positioned alongside retreads of the previous night’s PPV, Hell In A Cell. If Hell In A Cell left you cold last night, you probably won’t find much to love in the first hour of tonight’s Raw. As is too often the case with WWE programming, Raw spends the first hour of its show basically recapping what happened the night before and then running through iterations of those matches. I’m not completely sure what the logic is—does WWE assume that Raw viewers don’t have the Network? Is the creative team contractually obligated to repeat roughly 30% of each PPV on the following Raw?—but it absolutely drags down the first hour of this week’s show. It’s not even that those first few matches are bad, but rather that they kill the momentum and exemplify WWE being unable to get out of its own way in order to craft a compelling story. So, the crowd is hot after a solid Goldberg segment—a slight slip and the annoyance of having Rusev take the Jackhammer are certainly issues though—where he spears Paul Heyman, but Raw follows it up with Enzo Amore and Luke Gallows throwing candy and pumpkin guts at each other. It’s kind of fun and stupid on its own, but when considered within the context of Hell In A Cell, it’s yet another instance of WWE neutering Gallows and Anderson just as they start to build some momentum. As if that wasn’t enough to remind everyone that not a whole lot matters from week to week on Raw, a rematch for the Cruiserweight Championship is up next. As much as the rematch makes sense within the story being told, it’s still frustrating to know that WWE has multiple Cruiserweights at their disposal and yet is still choosing to run the same feud for weeks on end. Brian Kendrick walks away with the title here after purposely getting himself counted out, but odds are this isn’t the end of the battle between Perkins and Kendrick, and that’s a problem. It’s a problem because, to their credit, Kendrick and Perkins are telling one hell of a story. All the narrative beats are there: the former best friends; the protégé succeeding where his mentor failed, and the mentor then turning on his protégé; Kendrick doing everything he can to win while Perkins looks to play by the book. These beats are evident in every single match they’ve had, and yet the booking of the Cruiserweight division in general has made sure their feud falls flat. WWE did a major disservice to these performers when they debuted, and no amount of stellar storytelling can make up for the limp introduction so many weeks ago. So, on a macro level this is a typical episode of Raw. It’s got the same issues that plague so many other episodes—the three-hour runtime, the 50-50 booking, Mick Foley yelling. On a micro level though, there’s actually a lot of good stuff going on. Not great, not mind-blowing and memorable, but good. For instance, Raw takes the next logical steps in building its monsters Braun Strowman and Nia Jax, as they snag wins over eternal babyfaces Sami Zayn and Bayley. I can understand being upset that Zayn and Bayley didn’t pick up wins, but at the same time this is a logical step forward. It cements the legitimacy of Strowman and Jax against two opponents who thrive in the “underdog who loses a lot and then wins a huge match” role, and it makes sense within kayfabe terms. If you’re putting together a destructive Survivor Series team, how could you not choose Strowman and Jax? Plus, there are smaller stories peppered throughout both matches. The Battle Royal to determine a spot on the Survivor Series team sees Neville looking to prove himself and secure a bigger spot on the main roster, Sami and Braun continuing their feud, and Sheamus and Cesaro operating like clockwork until Sheamus’ ego gets in the way. Then, with Nia Jax vs. Bayley, you have Charlotte proving a point: that she’s made for the big time, and Bayley isn’t taking this whole main roster business seriously enough. That’s great storytelling. If only it wasn’t surrounded by such monotony. Small, delightful moments really do define much of the night, so let’s highlight some of them. Across three hours they can get lost in the mix, and even banished to the Stray Observations, but this week’s Raw boasted a bevy of fun moments. For instance: if you didn’t smile when New Day came to Raw dressed as the three faces of Charles Wright, then you’re either super young or watching wrestling for all the wrong reasons; Kofi wore a “Legit Boss” chain as part of his Godfather costume; Corey Graves and Byron Saxton have great chemistry, and their constant back and forth is miles ahead of anything Michael Cole ever did with JBL; Mick Foley fixes the way Roman Reigns carries his United States Championship; a mini Shield reunion takes place in the main event. These are all moments that enrich the stories being told. Now, if only Raw could remember what stories its telling and keep them moving from one PPV to the next. Then, maybe, it will live up to the promise and potential built into those smaller moments. Results: Enzo Amore defeated Luke Gallows (Trick or Street Fight); TJ Perkins defeated Brain Kendrick (c) via countout (Cruiserweight Championship match); Braun Strowman won the Battle Royal to secure a spot on Raw’s Survivor Series team; Rich Swann, Cedric Alexander, and Lince Dorado defeated Drew Gulak, Tony Nese, and Ariya Daivari; Nia Jax defeated Bayley; Sheamus and Cesaro defeated the Shining Stars; Roman Reigns (c) defeated Chris Jericho via DQ (United States Championship match). While that Goldberg slip was certainly embarrassing, there’s no denying the man’s presence. He brings something to the ring as soon as he’s in it. Can’t fault WWE for seeing money in that. Enzo and Cass’ promos can be pretty hit or miss, but between last night’s Toy Story burn and tonight’s Spongebob and Patrick bit, they’ve strung together some good trash talk. I’m always conflicted about how to approach kayfabe. On the one hand I think you have to let a lot slide in order to enjoy pro wrestling, and on the other hand I want even the smallest of details to make sense. So, Mick Foley going from needing Y2J and Roman Reigns on the Raw team to then scheduling them in the main event left my brain hurting. I love seeing Rollins with some babyface fire. His intensity brings a lot to the main event scene. Speaking of things I love, Charlotte threatening to end Nikki Bella’s career is exactly the kind of heel work that I fall for quite easily. 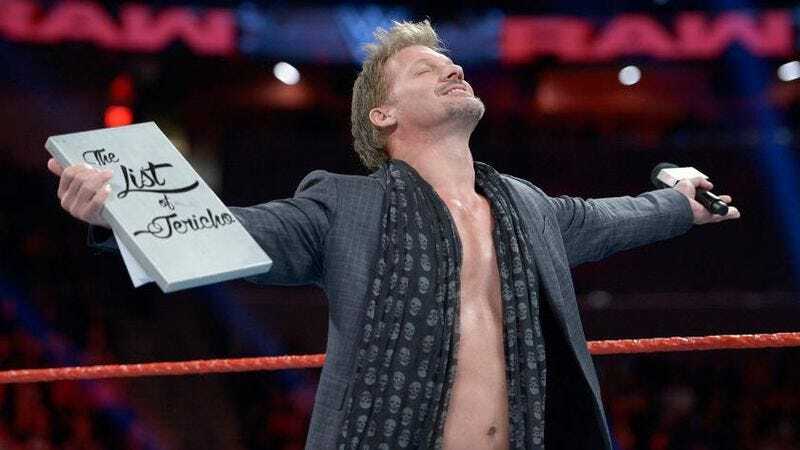 Another small moment that exemplifies great work: Jericho teasing The List before pivoting from it and saying nobody even deserves to be on The List. That’s some expert heel work on the mic from Jericho. I also really enjoyed Brian Kendrick’s promo on the way to the ring. Again, another instance of something smaller working—the Cruiserweights telling an actual story—while the bigger picture remains a mess. Rusev: “I don’t know who you think you are.” Goldberg: “I’m Goldberg, boy!” Seriously, Goldberg still has that intensity and it’s electric. Can Neville go the Braun Strowman route and just demand Mick Foley put him in some goddamn matches for once? What a waste of top-tier talent.